A Sports Illustrated writer, inspired by a family’s celebratory hockey photo, asks his 84,000 Twitter followers a simple question: How many of you have a photo of the best moment of your life? The writer, Richard Deitsch, is instantly besieged with photos of weddings, proposals, births, hospital recoveries, family gatherings. He begins to re-tweet the responses — all of them. A Twitter meme is born. I have written extensively of that day here. It was an amazing experience. So many obstacles overcome, so many logistical fears shoved aside. I fought tears many times that day, but always tears born of joy. There was a moment between the second and third period when I raced up to visit my family — Veronica and Riley and my parents — sitting together in the upper deck. We gazed down upon the full stadium and the swirling snow. There was Ryan on the ice, his helmet clearly visible with the tape markings I had put on it for just this purpose. He skated with freedom and joy. He hadn’t stopped grinning since our arrival at the stadium some six hours earlier. The tears welled up. Words failed me. I hugged my Dad and he just said, “I know,” which was acknowledgement of the enormity of that moment. Veronica shared a similar tearful and wordless embrace. My knees got weak. It was an overwhelming moment of so many emotions: pride at his achievement and all the obstacles he had overcome to get here, gratitude at the opportunity that had been offered, joy at witnessing it and sharing it with the people that mattered most to me in the world. I took pictures to share with family and friends. But I wanted to share this story in a wider way. In many ways, it was the impetus I needed to finally start blogging, three years after Jess and her audience encouraged me to do so. Celebrating Ryan’s triumphant day at the Winter Classic in the dressing room. These memories came flooding back as I looked through more of Mr. Deitsch’s responses. I searched for a good photo of Ryan from that day and sent it, using this blog’s Twitter account. Mr. Deitsch re-tweeted it. I received some nice replies, a bunch of re-tweets and a batch of new followers. My blog’s modest traffic spiked for a couple of days. There was even an interesting media inquiry. But I was not ready for what came a few days later: A request from SI to run the photo in this week’s issue, as part of a montage in the “Leading Off” section of the magazine. Sports Illustrated? Running a picture of my son playing hockey? Was this for real? It was. Mr. Deitsch’s instant Twitter meme received a lot of attention. It showed the power of social media to reveal some deeply human moments — the kind of connection that is often thought to be lost in today’s always-on digital culture. SI wanted to showcase some of the best of the sports-related responses it received. I anxiously awaited the digital download of the newest issue. I have read SI since I was a little kid. The magazine helped create in me a life-long love of both sports and sports writing. Among the first things I did after moving out of my parents’ house post-college, right after setting up my utilities, was to set up my subscription. Even though the dynamic has changed, with 24/7 coverage of sports on television and online, I still anticipate the new issue that arrives each week. I still read most of them cover to cover. And I always spend time browsing the photos in Leading Off. Never did I think I’d find my child in those pages. But there he is, along with the tweet I sent Mr. Deitsch a few short days ago. The enormity of it caused me to think about a do-over. Was that really the best moment? The best photo? What about my daughter? I rationalized. Yes, that was among the best moments of my life. I felt so on that day and have not wavered. Riley was a part of that day — it would not have been nearly as special had she not been there (boldly wearing a Devils jersey to a Flyers-Rangers game in the way that only she could pull off) to witness it. Of course I could have chosen something different. The shots of both my kids celebrating the Devils’ Game 6 Eastern Conference Final win over the Rangers in 2012 was right up there. Maybe a picture with Riley at a minor-league baseball game last summer — just me and my daughter out at a ballgame, having a blast. Or perhaps the shot of Ryan singing “Hail to the Victors” at a Michigan football game in 2009. Maybe one of Riley with me at an outdoor hockey game at Michigan Stadium in 2012. Or perhaps this blog’s cover photo — the one from my Father’s Day hockey clinic with Ryan three years ago. 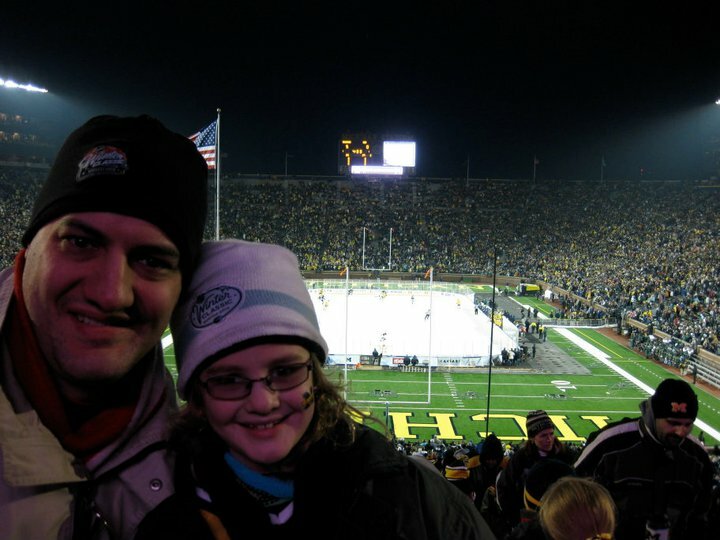 With Riley at the “Big Chill at the Big House,” Michigan Stadium, 2010. Another moment that would have qualified for the meme. Are you noticing a trend here? So many of these incredible memories involve sports. That’s not an accident. My kids come by their love of sports from both parents, and the togetherness we have been granted by this shared love is impossible to measure. But I’m happy with the shot I chose. I reacted in an instant and selected a moment that was incredibly meaningful for both Ryan and my entire family. I’ll put the question to you, dear readers: Do you have a photo of the best moment of your life? Feel like sharing? 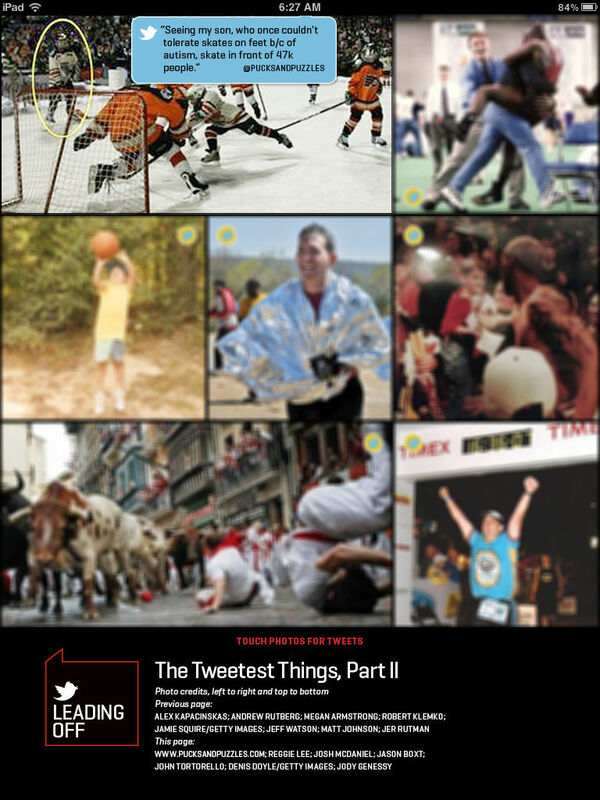 Tweet me @pucksandpuzzles. Heck, include @richarddeitsch too. He’s still posting the pictures he continues to receive. Who knows, maybe you, too, will end up in the pages of SI. Now if you’ll excuse me, I have to get to the newsstand and pick up a couple dozen copies. Love this. Oh my God on so many levels I LOVE this. Thanks! I’m glad you get it. And thanks for the push so many years ago. Also, check your FB messages! Priceless is a good word for it. The whole day felt like a MasterCard commercial. And to have it memorialized in this way is pretty cool. That’s how it feels. Thanks! Got to quit reading your blog at work….I am just thrilled…and now I have to reapply mascara. Congrats! I get that a lot but I’m not going for tears, I swear. Amazeballs!! So excited for you guys! Have you shown Ryan?? The best part was that he was actually excited about it. And when there was a report on Richard Deitsch’s Twitter meme on the CBS evening news he got VERY excited that they might show his picture (alas, they didn’t). Extra copies have been requested and should be arriving soon!